Jim/Ariel - Disney's Titanic Movie Poster. My Disney version of James Cameron's Titanic. :). 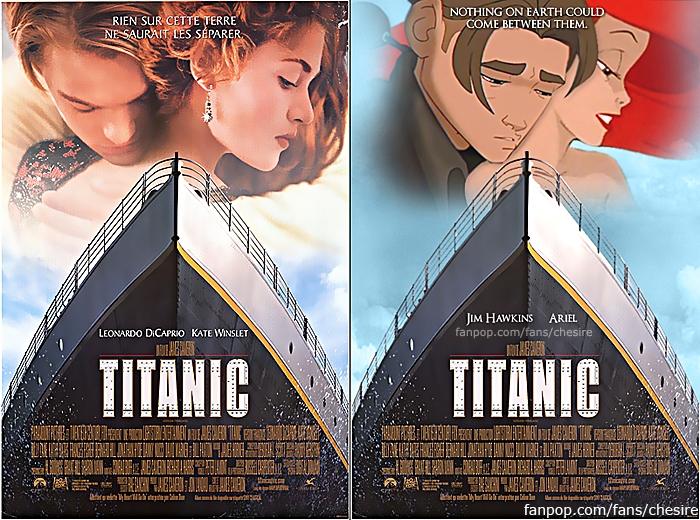 Wallpaper and background images in the disney crossover club tagged: disney crossover live-action movie movie poster titanic. This disney crossover photo might contain teken, poster, tekst, bord, schoolbord, glas in lood raam, and glasraam. Damn it! I was gonna do this! Perfect!!! You even changed their names!!! This is so perfect and this is my favorite movie and Disney crossover! This makes me really happy! Thank you! i think that is one of your best work!!!!!!!!!!!!!!! Aaaaaaaaaaaaaahhhhhhhh, chesire your poster is making me question my view on this couple and my sanity. ^Haha, I can see that.